Hi, this is my first attempt at a Raspberry Suite challenge and I'm really excited. I made a special trip to the craft store to source some gold/orange paper (lovely and shimmery). No Kraft paper again, so I had to make do with the back of jotter pad! So, here goes. I was thinking about silhouettes from the Moxie Fab challenge as well as the rich chocolaty palette and decided to create a boudoir kind of feel with a cameo. I designed and cut the profile piece (pencil and Kraft knife), and framed it with the chocolate cardstock (looks rich and dark in real life). I created some cheeky ruffles with ribbon for the cream element and added a little sparkle for the Orange/Gold. Voila! Wow, Fabulous card!!! I can't belive you cut that profile by hand and great job designing it! Love the shimmery paper and that ribbon detail is the perfect touch! Hey... thanks for adding my blog to your blog roll! You are a master with the pencil and knife! That looks like a machine cut piece. WOW. Great job! Hi Maile and Chrissy. Thank you for the comments. Yeah, it is amazing what you can do with a sharp knife and a bit of patience ;-). Not sure of the blog etiquette for replying but hopefully this will reach you both somehow. How elegant! Love it!!! You're too motivated to cut that thing but very well worth it! Love your brads and your ribbon. Fabulous job with Dawn's color challenge. Wow! 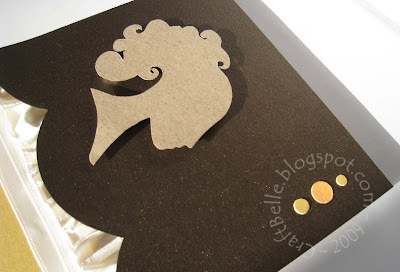 Your handcut silhouette is fantastic! I think you've acheived a really luxe feeling with this card. Looking forward to seeing more of your work in future challenges! 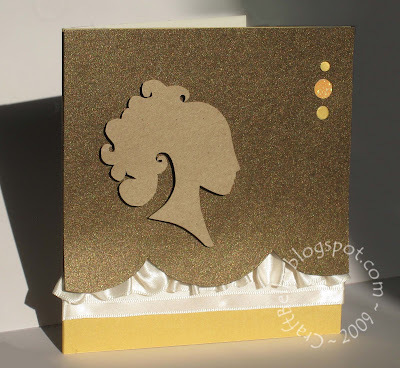 I LOVE the handcut silhouette-so beautiful!